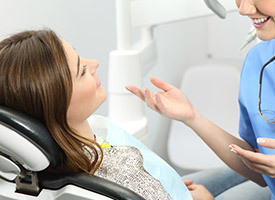 Many patients are fearful or anxious when it comes to dental appointments, but there is one dentistry service that can intimidate even the bravest patients – root canals. Root canal therapy is actually not the cause of the pain many patients associate with this treatment. 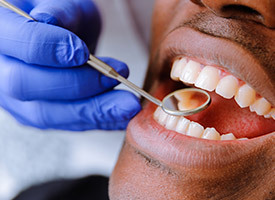 Instead, a root canal can actually relieve a toothache and dental sensitivity and enable your dentist to save a tooth that would otherwise need to be removed. At Robison Dental Group in Canton, we offer comfortable, effective root canal therapy to relieve pain and renew your smile. Call our team to find out more or schedule an appointment. We typically see patients who need root canal therapy on an emergency basis, so please don’t hesitate to reach out to us if you experience any of the common warning signs of root canal infection. Why Choose Robison Dental Group for Root Canal Therapy? “Root canal” is actually a bit of a misnomer. 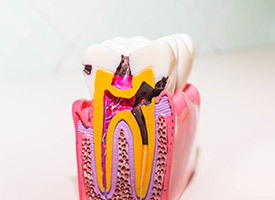 The root canal is the inner layer of the tooth’s root system through which the nerve tissue runs and attaches the tooth to gum tissue and the jawbone. Root canal therapy is needed when dental damage or decay reaches the inner layer of the tooth. The pulp is the soft tissue in the center of teeth that houses the tooth’s nerve. When the nerve is touched by dental damage, the result is the painful toothache and dental sensitivity that most patients associate with root canal therapy. In order to protect the tooth from extraction, the nerve and pulp tissue need to be removed. How Will I Know I Need a Root Canal? Your root canal procedure will be quick and comfortable. We begin by numbing the area around the tooth to be treated. We drill a small access hole from the top of the tooth to interior pulp layer. Then, the damaged pulp and nerve tissue are removed. In some cases, we will need to use oral or topical antibiotics to remove infection before completing treatment. Next, we refill the tooth with a biocompatible material and seal the access hole we created. In most cases, we will also place a dental crown to protect the root canal treated tooth.